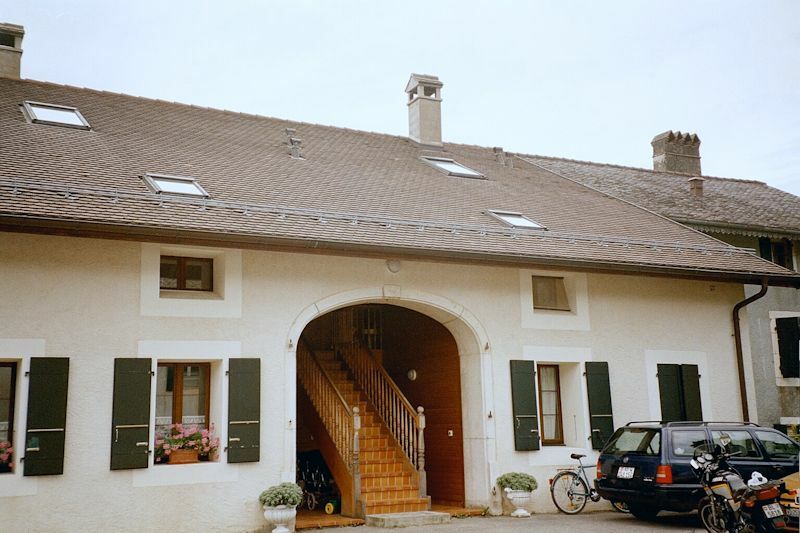 In summer 1998, Mr Peck vacated Trélex in haste and moved his books, computers, skis, and a few clothes to a new little bachelor flat in the village of Bassins, Switzerland. Bassin means 'pelvis' in French, but that may not be related; it can also be used to mean 'bedpan'. It also means 'water trough', and since we've got them in abundance all over the village, possibly that's whence our ancestors fetched the name. 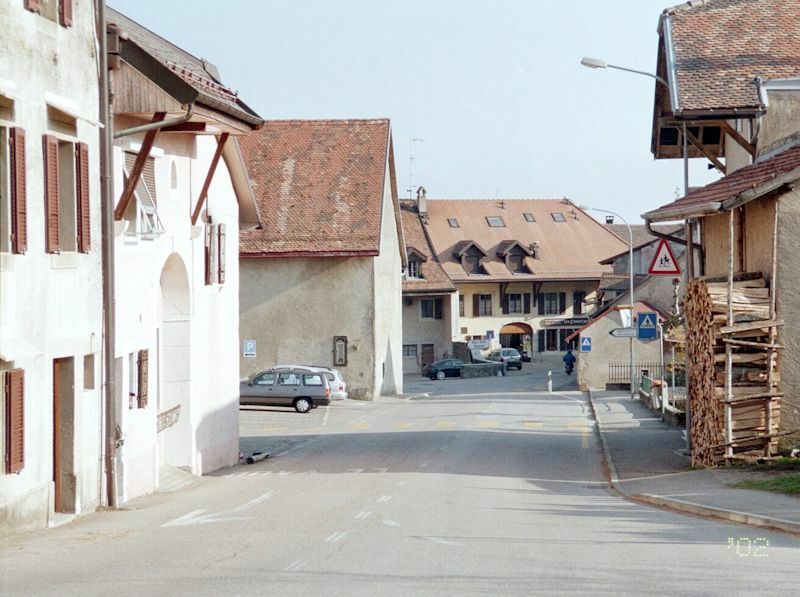 Slightly more than 800 "Bachenards" live here presently (1,200 by 2007), many in the old central village at 750 meters altitude, some in the new upscale suburbs further up the hill, and a growing number in the very new industrial-style villas currently being built off to the right. 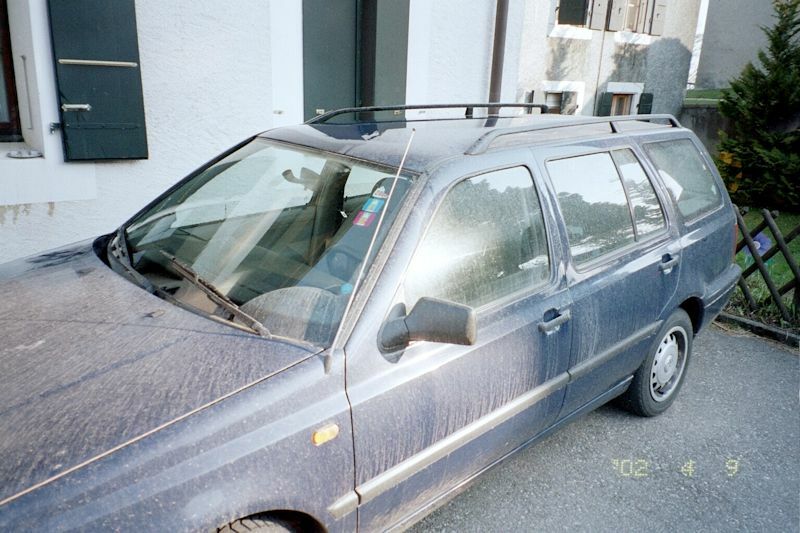 This one, in April 2002. 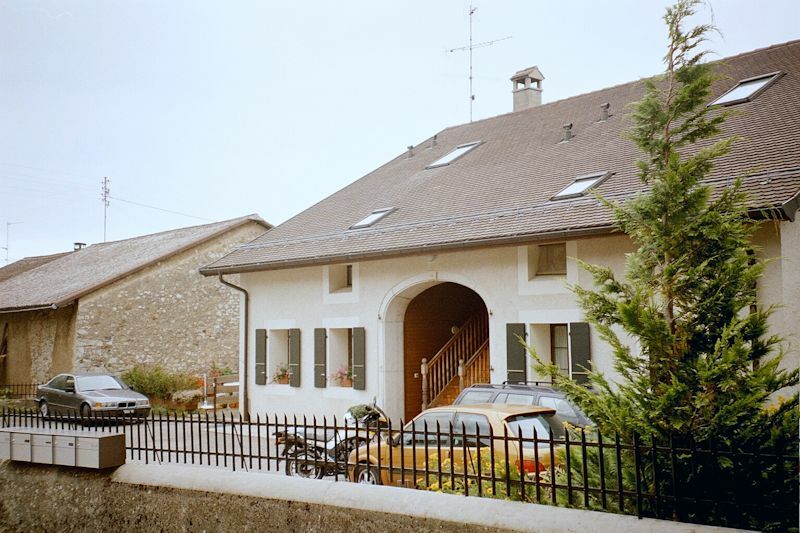 Here's the same renovated farm building, built in 1868, from the other side, on the Rue de l'Eglise. 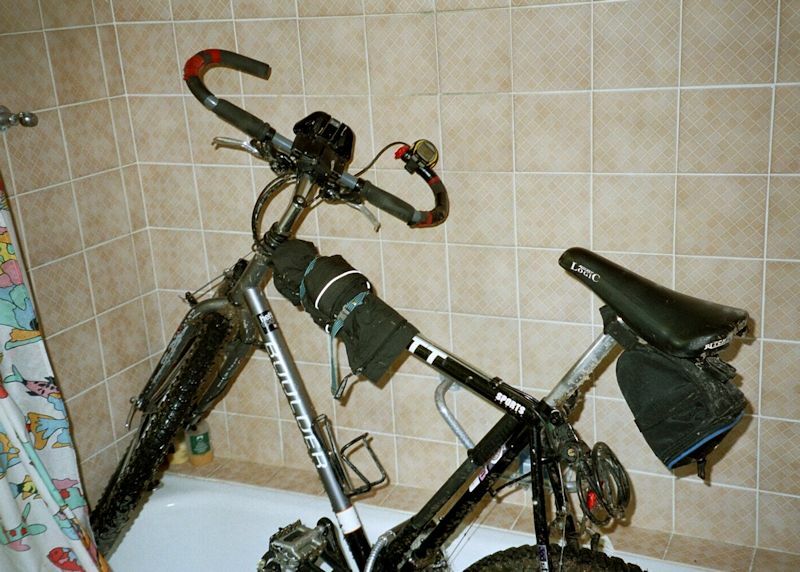 Mr Peck lives in the flat on the ground floor right, behind his stunningly utilitarian blue VW "break" or station wagon. Extremely nice neighbors live in the other three flats, and the kind owner lives in the adjoining main house off to the right. 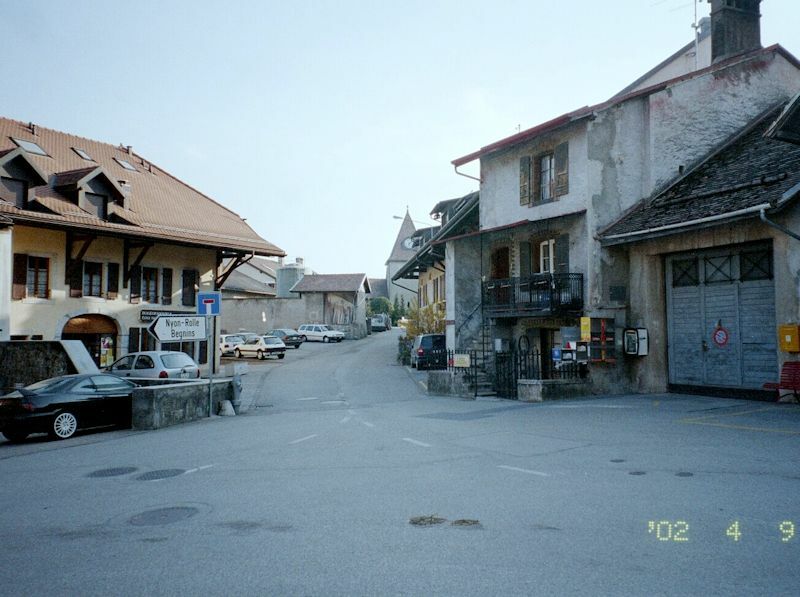 Here's the Rue de l'Eglise in front of the house looking down into the Place des Tilleules (lime or linden trees), the central village square, seen from the . . .
. . . Eglise. 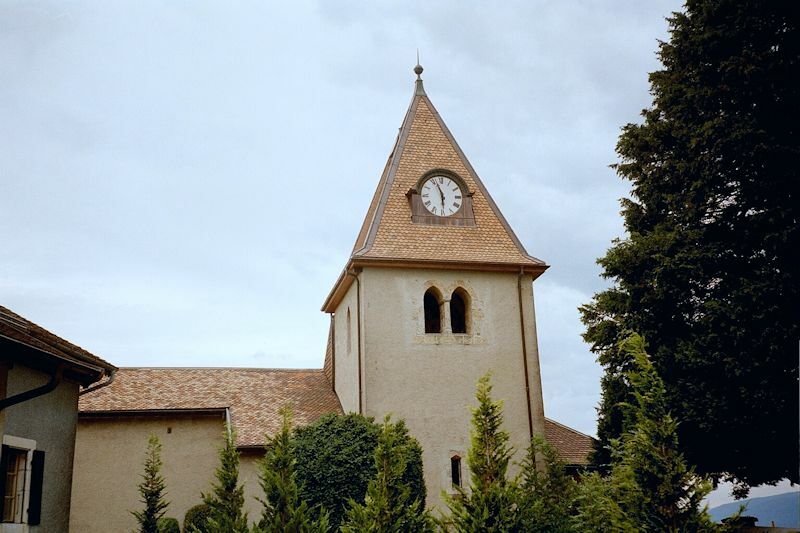 This fine little hilltop church (with the troublesome clock), begun in the 12th century, stands at the top of our street. Our front porch, so to speak. Our street again, the dead-end Rue de l'Eglise ("Church Street"), looking down into the Place des Tilleules in the center of the village, where the shops and the auberge ('hotel-restaurant') reside, as did the post office until 1 January 2002, at which time they did a little American-style cost-cutting ('in order to compete') and closed it up entirely. 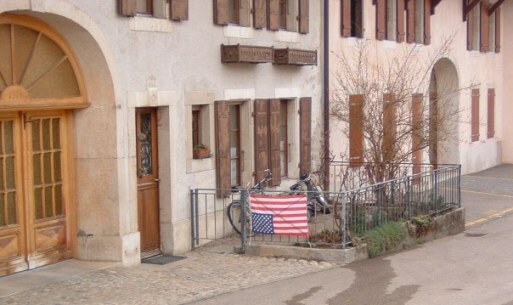 The rue de l'Eglise in March 2003, on the occasion of the Bush invasion of Iraq. 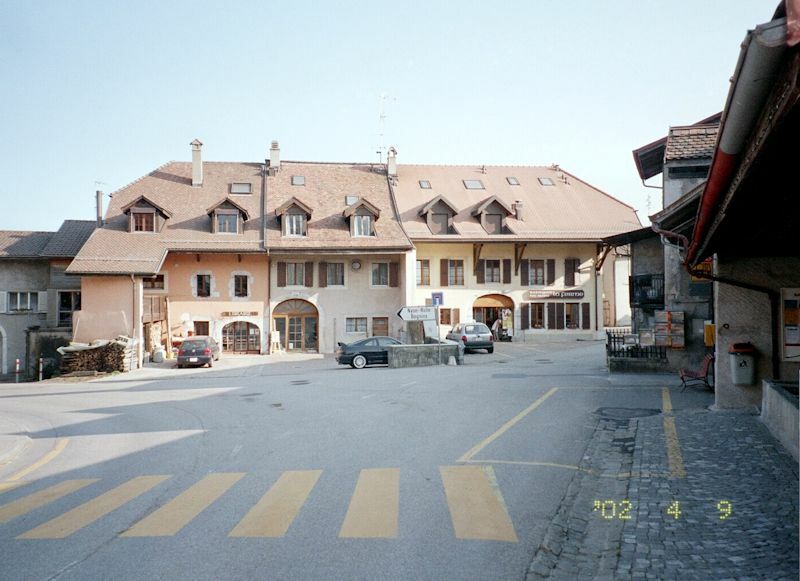 The central Place des Tilleules again, with the bookstore and bakery/pastry shop/tea room in the center and the Rue de l'Eglise leading up on the right. And the bookstore and tearoom again from farther up the street. 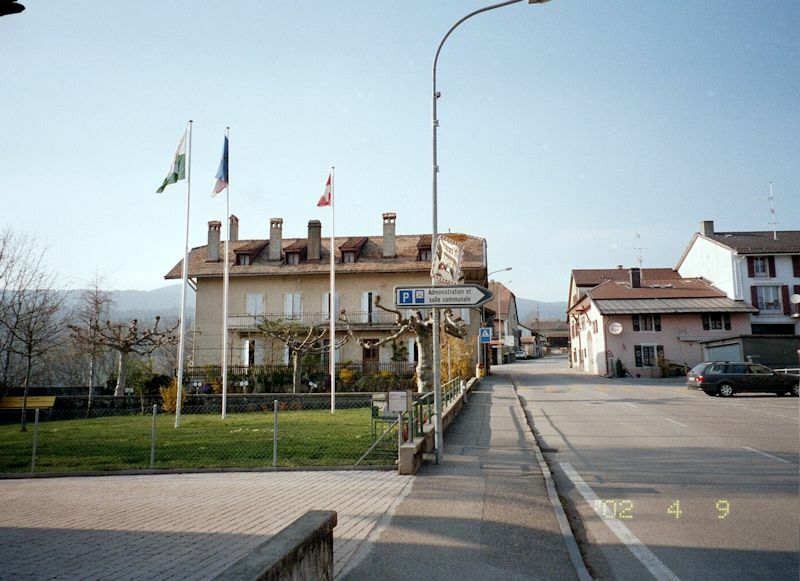 A little park in the center of the village, facing the auberge, with its flags and petanque pitch. 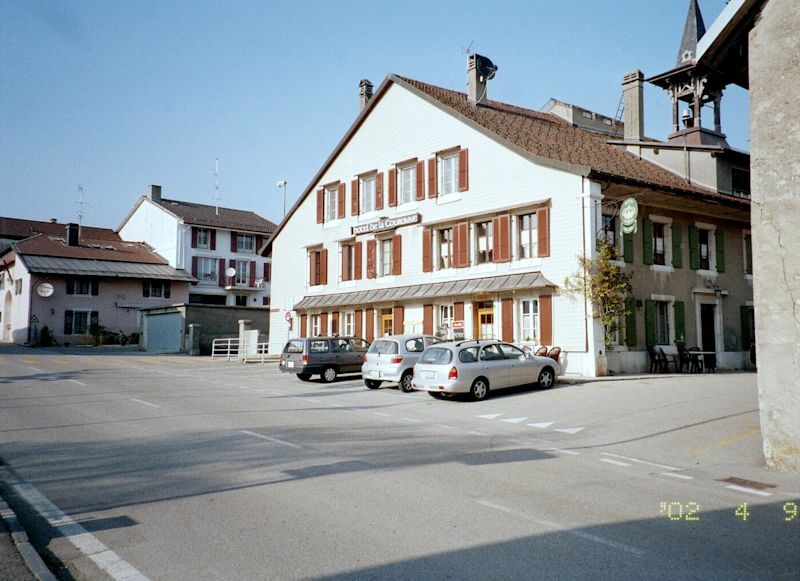 Across from the little park, the Hôtel de la Couronne (Crown Hotel) with its very respectable restaurant and café, and the village administration buildings and a large part of the village school included. 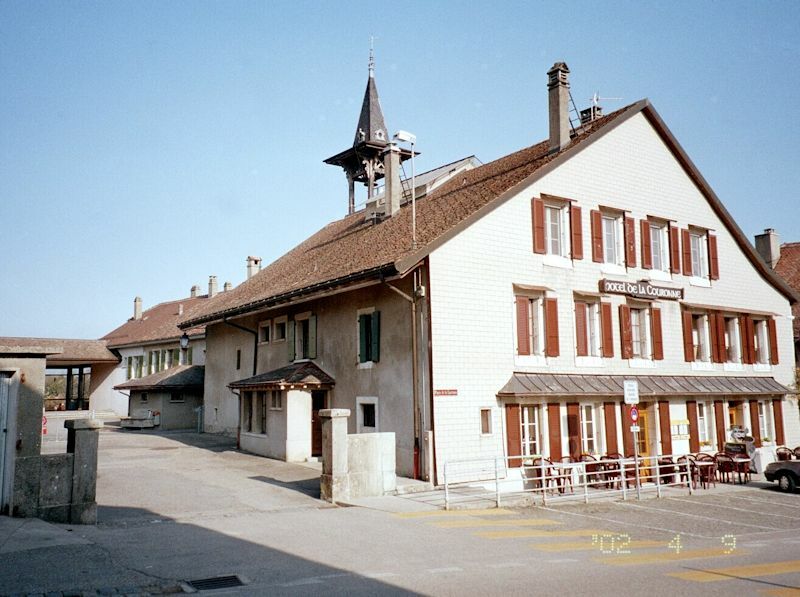 The school bell tower dominates the building. 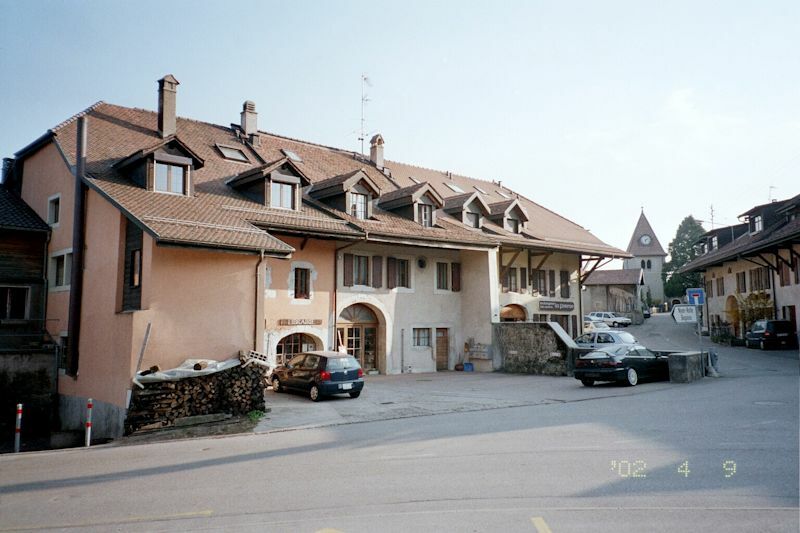 The auberge (or "inn") again from farther up the street. 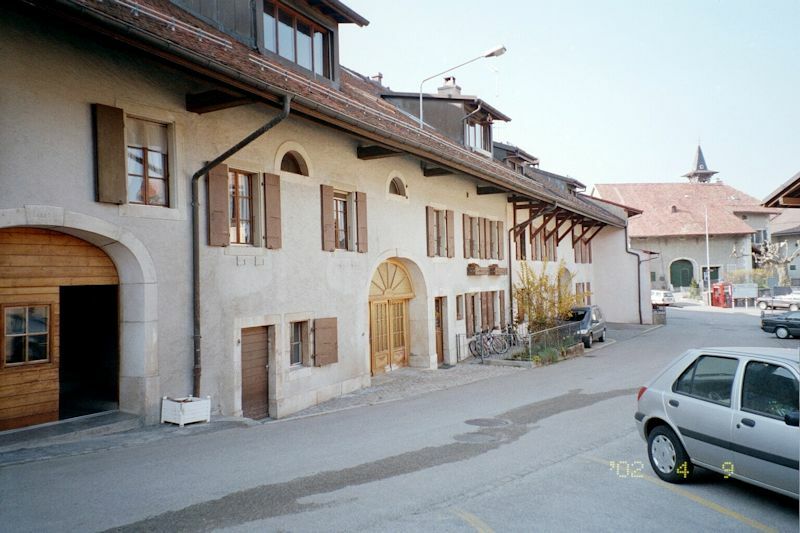 The long side of the auberge, with the village administration offices and, at the end, the school. Looking back down the street towards the tearoom in the Place des Tilleules. The intersection from which the preceding photo was taken, looking uphill, past one of the ubiquitous water troughs. 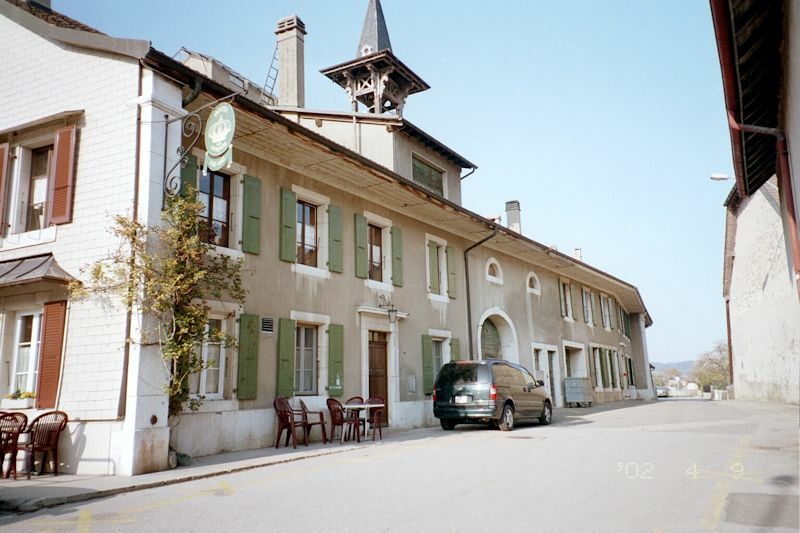 An interesting old house on a small street out to the side of the village. Behind it, however, lie some fairly disaesthetic villas still in construction. A whole line of them, in fact, sort of salmon colored if you can imagine. The church was begun in the 12th century, evidently, and bits and pieces rebuilt and restored over the intervening centuries . . . 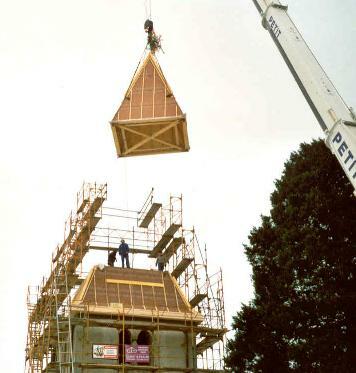 In November 1999, the steeple was replaced by a new one, supposedly made in Yverdon out of wood from the forests of Bassins. 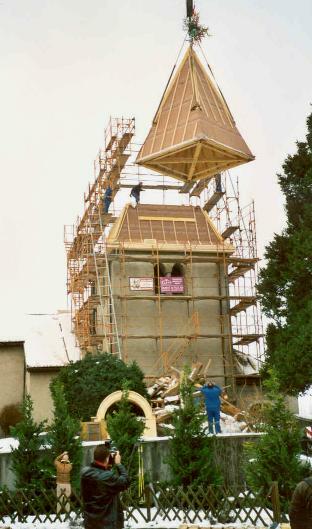 The process of installing it, in two pieces, with tolerances of an inch within the scaffolding, was an artisanal and engineering tour de force, worth spending a chilly morning off from work to watch. 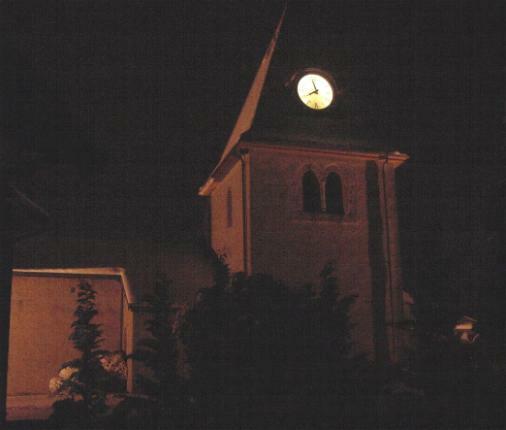 At night. Almost enough to make a decent person turn to religion. From the far side, amidst its comfortable and welcoming cemetery. 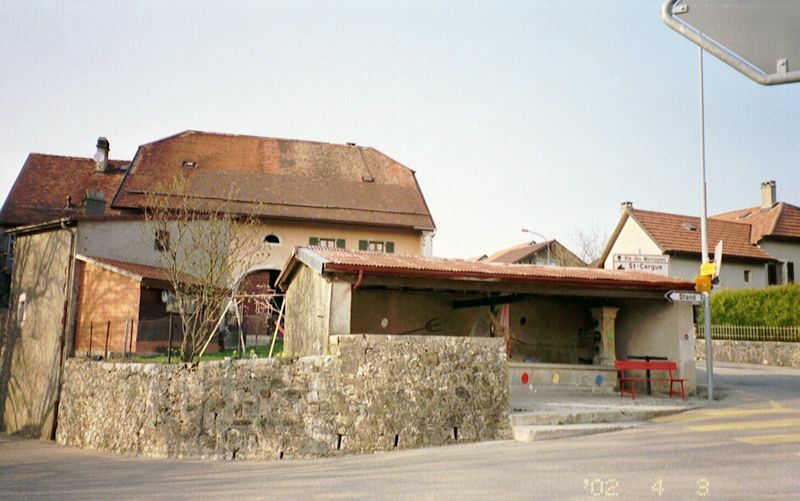 Here's an English translation of some background on the Cluniac associations, taken from the entry in Les sites clunisiennes, http://fsc.cluny.free.fr/sites/bassins.htm. 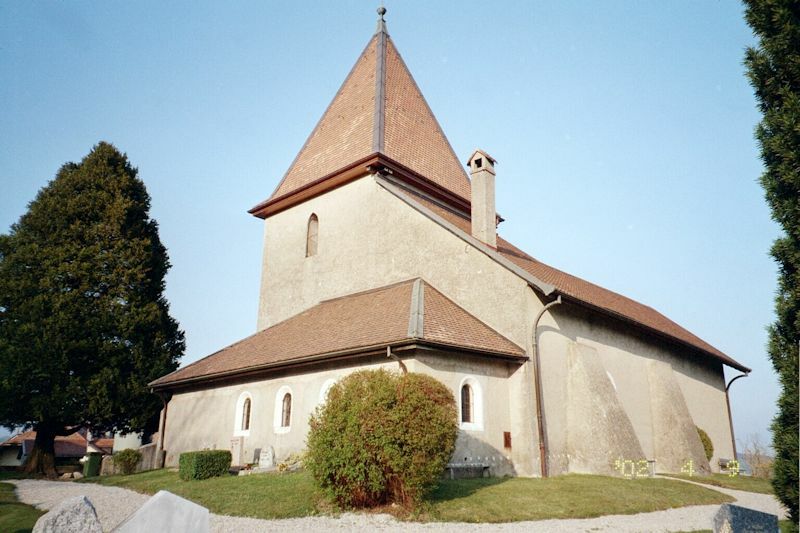 The church of Notre Dame of Bassins probably became Clunisienne in the 11th century, following the donation made to Cluny by Humbert I, lord of Cossonay and of Prangins. 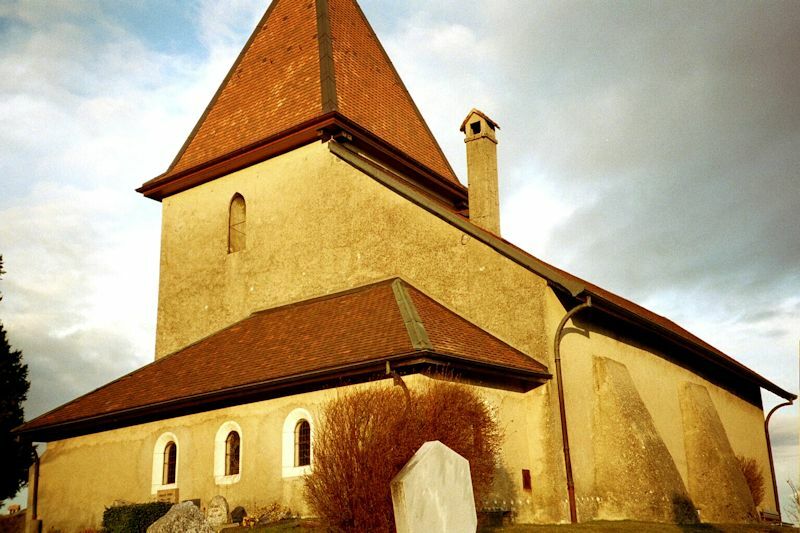 Pope Lucius III confirmed this Cluniac possession in 1183 and placed it under the monastery of Payerne. The little priory that was born there seems to have been the centre of active agricultural exploitation, and the seigniorial rights of the monks were allied to those of the local lords - the sires of Prangins long held the right to represent the priory in matters of justice and to carry out the punishment of those judged guilty. 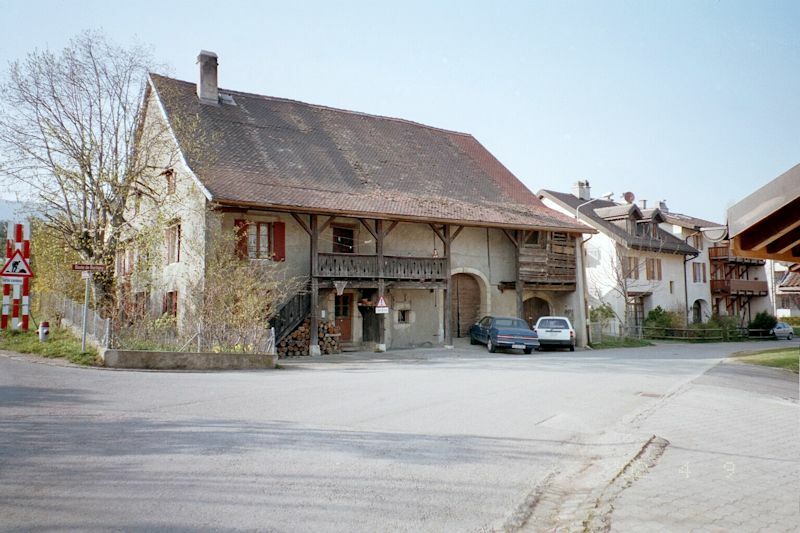 The Prior of Payerne kept a strong hold on Bassins until the beginning of the 16th century, a period in which he named the châtelain and other officers of the place. 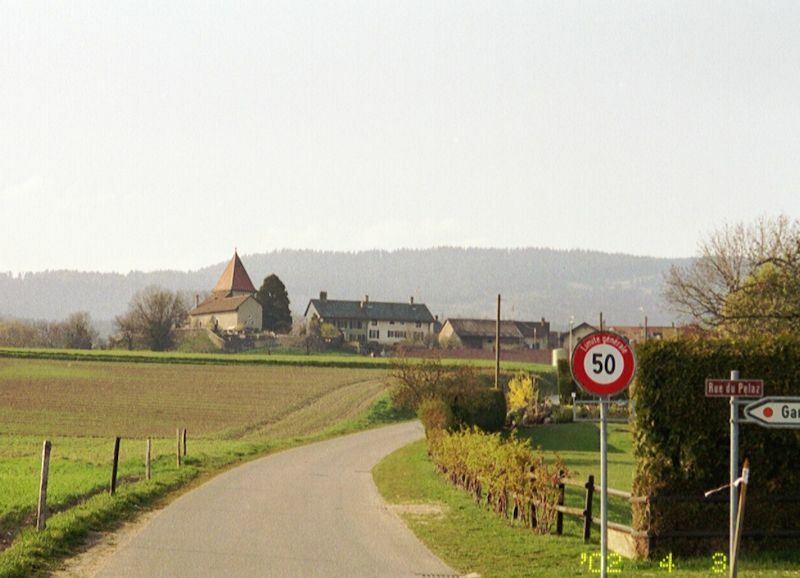 In 1536, the Protestant Reformation put an end to several centuries of Cluniac presence in Bassins. 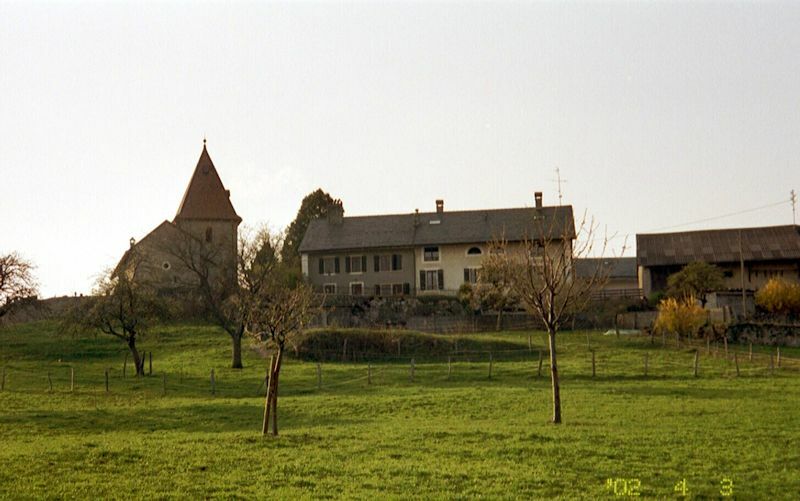 Of the whole rural priory of Bassins only the church of Notre Dame has survived, of which the choir is the most ancient part; the foundations of the original building have been found in the present cemetery. The oldest part probably dates from the 10th century, with additions in the 12th, 13th, 15th, and 16th centuries (like the tower and the narthex, from a later era but of uncertain date). We know that the little side chapel, dedicated to the Virgin, was founded in 1406 by a local lord, Girard of Penezat. As to the larger chapel, also from the 15th century, it is from the Brotherhood of the Holy Spirit that it had its origin. What a lovely church! Mostly now disused, unfortunately. Weekly services were consolidated about a year ago, presumably with a shrinking churchgoing population, to Begnins nearby, and as nearly as a neighbor trying to sleep in on a Sunday morning can tell from the bell-ringing patterns, it's now used mainly for weddings, funerals, and a handful of regular services per year to keep the mold from growing on it. 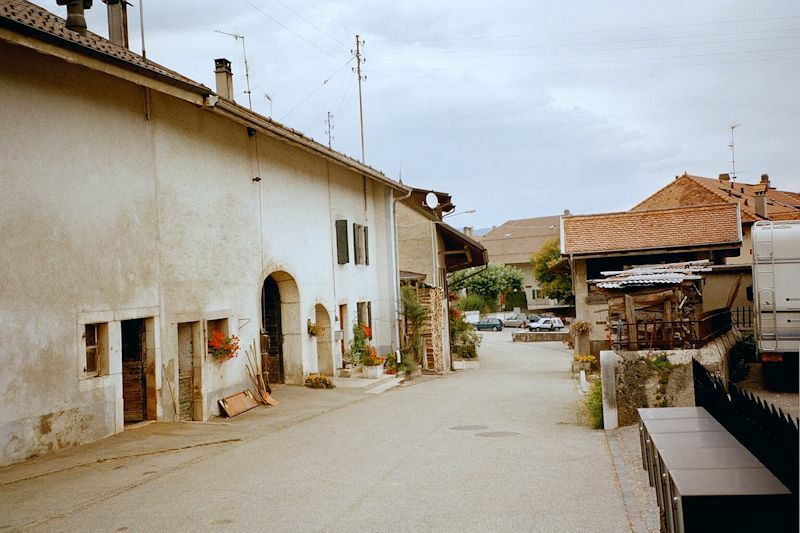 And a closing view of the Rue de l'Eglise, April 2002. 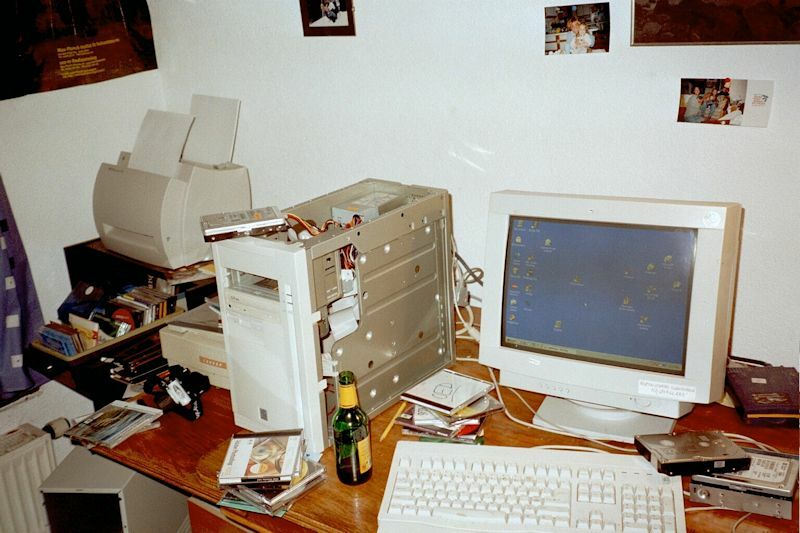 This is our new computer, in October 2001, undergoing a little customizing. And this is our cozy workstation, the diningroom table being put to good use next to the livingroom window gazing out upon Lake Geneva, with the lights of the far shore in France twinkling. A three-computer network, some scanners and what not, plenty to keep us off the streets at night. The other end of our tiny livingroom. 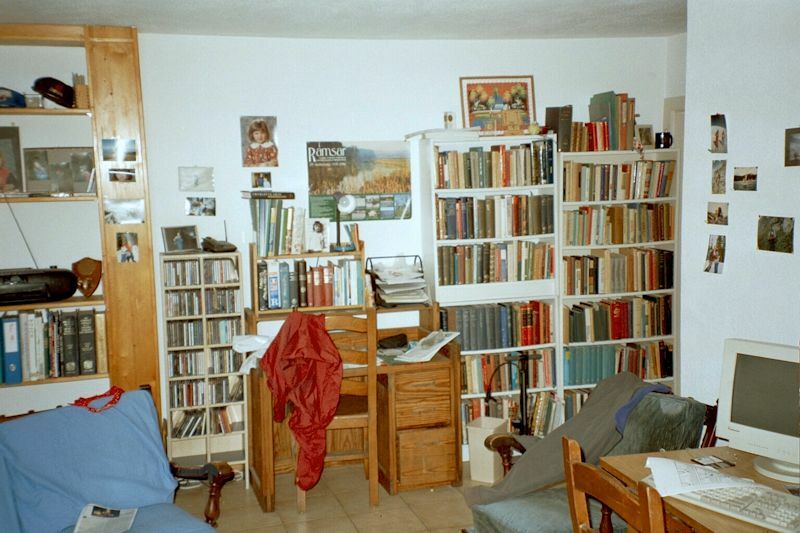 Not much else here -- a pullman kitchen, two small bedrooms, more bathrooms than occupants, 3-foot-thick walls, and a fridge full of beer with some frozen vegetables wedged in wherever they can be wedged. Feedback and suggestions are welcome if positive, resented if negative, . All rights reserved, all wrongs avenged. 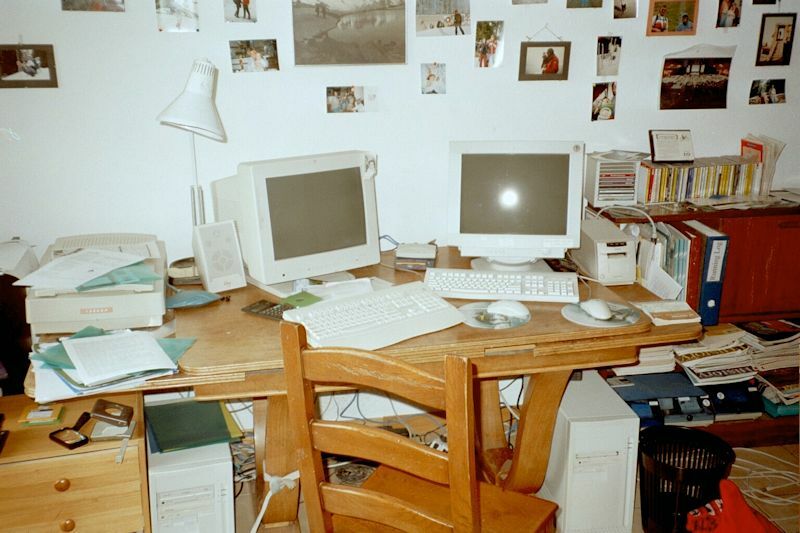 Posted 7 September 1998, revised 7 January 2011.